(17/P42) TRENTON – A 205-foot vessel immortalized for its service as a Coast Guard cutter that conducted daring rescues during a brutal 1991 East Coast storm was deployed today off Cape May to become part of an artificial reef comprised of old military ships that is enhancing fishing opportunities off New Jersey and Delaware. The sinking of the U.S. Coast Guard Cutter Tamaroa, formerly the Navy fleet tug Zuni, at the Del-Jersey-Land Inshore Reef, located 26 nautical miles southeast of Cape May, was carried out by Coleen Marine Inc., a contractor for the Delaware Department of Natural Resources and Environmental Control (DNREC), in partnership with the Department of Environmental Protection. 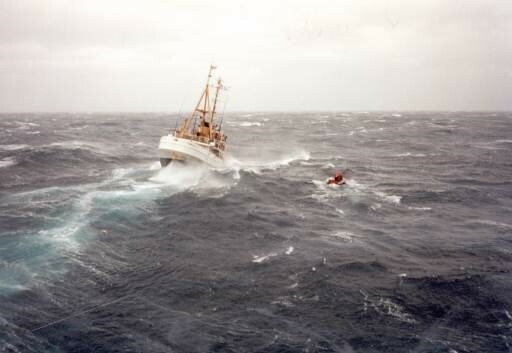 The vessel was featured in the bestselling book The Perfect Storm and the movie of the same name. As the Zuni, the vessel supported landings by the U.S. Marine Corps in the pivotal 1945 Battle of Iwo Jima. It is believed to be the last surviving vessel that directly supported those operations. The cutter was deployed in water more than 120 feet deep after patches were removed from holes that were pre-cut into its hull. The Zuni/Tamaroa joined the former Army freighter and Navy support ship Shearwater, the minesweeper Gregory Poole, and the 563-foot destroyer U.S.S. Arthur W. Radford, the largest vessel ever deployed off the East Coast. The reef, established 10 years ago specifically for former military vessels, is jointly managed by New Jersey, Delaware and Maryland. For much of its Coast Guard career, the Tamaroa served out of New York City, and toward the end of its service it was based in New Castle, N.H. Its Coast Guard roles included fisheries enforcement, drug interdiction, immigration enforcement and ice patrols in locations as far-afield as the Caribbean, the Straits of Florida and the vast North Atlantic fishing ground of Georges Bank. Over its nearly five-decade Coast Guard career, the Tamaroa, also known as the Tam, responded to numerous sinking and disabled fishing and pleasure boats, took part in the rescue of passengers from a sinking ocean liner, recovered bodies from an airliner that crashed off the coast of New Jersey, rescued hundreds of Haitian migrants from overloaded boats, saved the crew of a storm-battered Soviet freighter, and intercepted drug runners and smugglers. But the Tamaroa gained fame for its rescue efforts during the 1991 Halloween Storm – a rare convergence of a hurricane and a massive low pressure system from Canada – that battered the East Coast and was chronicled in Sebastian Junger’s bestselling book, The Perfect Storm, made into a hit movie starring George Clooney and Mark Wahlberg. The Tamaroa first assisted in the rescue of three people from a sailboat caught in the storm. Then, battling massive swells and making eight separate approaches, the vessel rescued four of five crew members from an Air National Guard rescue helicopter that ran out of fuel and had to ditch 90 nautical miles south of Montauk, Long Island. The fifth member was lost at sea. The Tamaroa and its crew received Coast Guard commendations for the missions. 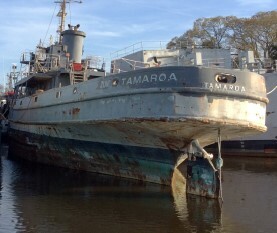 Plans to restore the Tamaroa as a museum were scuttled due to its advanced age that made work very costly and unfeasible. The Zuni/Tamaroa was prepared for reef deployment in Norfolk, Va., where the vessel underwent extensive environmental preparation. Interior paneling and insulation were removed and the ship was thoroughly cleaned of fuel and hydraulic fluids. The ship’s environmental tests were approved by the federal Environmental Protection Agency. The vessel also met Coast Guard standards for sinking as an artificial reef. The New Jersey Division of Fish and Wildlife currently holds permits for 15 artificial reef sites – 13 in federal waters – including the Del-Jersey-Land Reef – and two in state waters. The reefs, encompassing a total of 25 square miles of ocean floor, are made up of a variety of materials such as concrete and steel, fishing boats and barges, even subway cars and Army tanks. These materials provide surfaces for a wide diversity of marine organisms to grow on the otherwise flat and featureless continental shelf, ultimately providing habitat for many species of fish and shellfish. DEP studies have shown that these materials are colonized quickly with organisms such as algae, barnacles, mussels and blue crabs that attract smaller fish which, in turn, attract species that are popular with recreational anglers. Older vessels such as the Tamaroa are ideally suited for artificial reefs “because of all the voids and cavities in them below deck – they’re really the perfect sanctuary for fish,” said Delaware reef coordinator Jeff Tinsman. The U.S. Navy commissioned the vessel on Oct. 9, 1943, as the fleet tug Zuni. In February 1945, the Zuni arrived three days after the initial amphibious assault of Japanese-held Iwo Jima by the U.S. Marine Corps, assisting follow-up landing craft in funneling more troops and equipment into the attack on the barren volcanic island southeast of Japan. The Zuni, nicknamed the Mighty Z, towed damaged ships to safety and rescued hundreds of crew members from torpedoed ships during its war service. The Zuni was decorated with four battle stars, among many other honors. Upon its transfer to the Coast Guard after the war, the Zuni was refitted for service as a cutter and renamed the Tamaroa, after a Native-American tribe that once inhabited the central Mississippi River Valley. Among its many exploits during 48 years of Coast Guard service, the Tamaroa rescued passengers from the Andrea Doria, an Italian luxury liner that sank off Nantucket on July 26, 1956, after colliding with a Swedish liner. Five weeks earlier, the Tamaroa had assisted in recovering bodies from a Venezuelan airliner that crashed 32 miles off Asbury Park. In March 1984, the Tamaroa assisted in the rescue of the crew of a Soviet freighter that foundered in bad weather off New Hampshire. The Russian crew went on to enjoy a circuit tour of New York and Washington, D.C. that included a warm welcome at a Gloucester County diner. Five years later the Tamaroa saved hundreds of Haitian migrants while on patrol in the Caribbean. The ship also made a special mission to save a Cuban man who had paddled 40 miles out to sea on tire inner-tubes. The Coast Guard retired the Tamaroa in 1994, and donated the vessel to the Intrepid Sea, Air & Space Museum on the Hudson River in New York City. A former crewman started a group to restore the vessel. 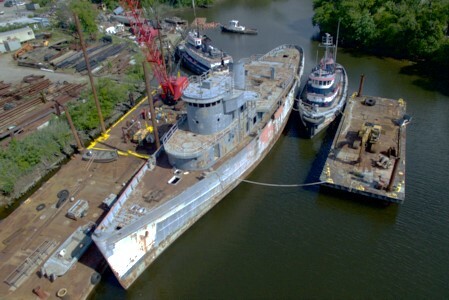 Work was under way in Virginia when a 2011 storm flooded the Tamaroa’s engine room. Its hull also showed numerous signs of failure, making restoration impossible. Delaware paid for the bulk of the acquisition of the cutter, preparation and sinking, assisted by the DEP, which received funding from the Ann E. Clarke Foundation and the Sportfishing Fund. PHOTOS/Top: U.S. Coast Guard; Tom Middle: The Sportfishing Fund; Bottom Middle: U.S. Coast Guard; Bottom: Coleen Marine, Inc.